During my time in Lebanon I visited an all-women cluster munition clearance project run by Norwegian People’s Aid (NPA) in Tibnine, a town in the central part of South Lebanon. I wanted to see their work and brief two of the women that were invited to attend the Oslo Signing Conference of the 2008 Convention on Cluster Munitions. I haven’t found a place to write up the notes of this visit so thought I’d share it here. So when I visited the town more than two years on it was no surprise that clearance teams were still removing and destroying these bomblets. The eight-woman clearance team was conducting surface and sub-surface clearance in gardens and orchards and entrances to houses on a hillside. Normally the team is larger, but two of the women are pregnant. The NPA site supervisor Lamis Khalil Zein (on the left in this photo) gave us an excellent briefing on the team’s work. I found the terminology quite different from mine clearance. The women call themselves “searchers” (not deminers) who engage in “battle area clearance” (not demining) using “locators” (not metal detectors). Lamis told me that she decided to apply for the clearance job in 2007 after hearing that NPA wahiring women. Previously an English teacher in Tyre, Lamis is a mother of two. 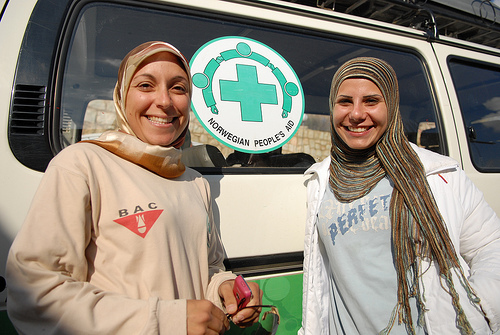 The other woman who came to Oslo was Mirna Mahmmoud Aashour (on the right in the photo). Mirna lives with her family in Tyre and is completing a university degree in geography. NSP Research – Updates is powered by	WordPress 2.9.2 and delivered to you in 0.124 seconds using 22 queries.